The New Humanitarian | The war’s over but what next for former combatants? The war’s over but what next for former combatants? John Weah doesn't blink when asked how many people he killed during Liberia's civil war. “38!" he says proudly. Only when he lost his leg did the tally stop rising. “I don’t know their names. They were not my friends. They were my enemies. They wanted to kill me,” he told IRIN in the central town of Gbarnga as he picked off the red nail varnish on his fingernails. Weah is now halfway through his stay at a cantonment site, ringed with bundles of barbed wire to keep former combatants in and drug dealers out. He is spending four days being detraumatised and counselled to prepare him for living in peacetime. The 19-year-old's left leg was amputated below the knee after he was shot whilst fighting in the bush. The government militia recruited him in 2001 when he was just 16. Weah has a crude crucifix tattoo on his upper right arm and says he's a Christian. But the red nail varnish, which also decorates the toes on his remaining foot, is more akin to the “juju” or magic fighters believe make them invincible. In return for handing over his gun, Weah will receive US$300, in two parts, as part of his demobilisation package. He says he's going to set himself up buying and selling goods, like he used to before he was forced to become a fighter. Though he quite likes the idea of buying a baseball cap and stereo, too. More than 54,000 former combatants have been disarmed according to figures up to mid-July. Humanitarian workers across the heavily-forested West African country emphasise that for long-term stability, the former fighters need jobs. But after 14 years of fighting, education and skills levels are low. “I have 300 to 400 jobs that I cannot fill: carpenter, forklift truck operator and so on. There is just not the skilled workforce here to fill those jobs,” Jacques Klein, the UN Special Representative to Liberia, told IRIN in his office in the capital Monrovia. Only around half the men can read, and for women it drops to 25 percent, Klein explained. Civilian police (CivPol) personnel also complain that they are struggling to find enough literate candidates, though there is no shortage of applicants. 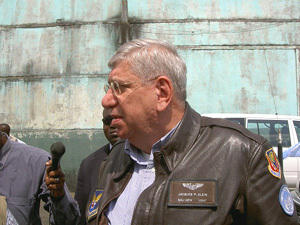 [Liberia] Jacques Klein in Monrovia. “I feel so bad for these guys. It’s not their fault they didn’t go to school, but they have to have basic literacy to be a police officer,” said David Volden, a CivPol training officer in the eastern town of Zwedru. “They are so desperate, they want to get in so badly but they can’t read and write,” he said. "We find that the 30-year-olds generally do a lot better than the younger guys, while the women are the most likely to be illiterate." Standards of English, one of the national languages and the government standard, is appreciably better among middle-aged Liberians. Teenagers and young adults, usually the better educated group in other African countries, have had their schooling so badly interrupted that they often can’t spell their name, or don’t know the year they were born. As part of the reconstruction of Liberia and to keep youngsters out of trouble, Klein intends to put thousands of Liberians to work in much the same way as the men were put to work on public projects in the United States during the Great Depression. “Back in the 1930s the U.S. developed the civilian conservation core - that’s the model we’re using here,” Klein said. In a country with barely any infrastructure, there is plenty to do. There is no electricity grid in Liberia. The capital Monrovia runs entirely on generators. Towns and villages that once had mains electricity and running water now rely on kerosene lamps and water is drawn from a hand pump unless the looters got to that too. The only telephones that work are mobile phones and they are routed through Monaco in Europe. Telephone and electricity cables were stripped from the masts in looting during the war. Roads have disintegrated. The main road that links Tubmanburg with Voinjama in the north is now impassable, overgrown by forest. The coastal road from Buchanan to Harper in the east is also out of bounds as nearly every bridge that crosses one of the many river outlets, is destroyed. There is plenty of construction work to be done but rebuilding a country is not just about bricks and mortar. It's also about reuniting societies and communities. “Our main challenge is going to be reintegrating ex-combatants into society. Whether they will, as I hope, be accepted back… we will have to wait and see,” Daniel Opande, UNMIL force commander, told IRIN. The combatants are in the cantonment sites for at least four days, where they have access to group counselling. They are also given a medical check up and are asked about what kind of schooling or vocational training they may want to help them rebuild their future. But there is some resentment among non-combatants who are not getting cash handouts, trauma counselling, medical check ups or promises of vocational training. 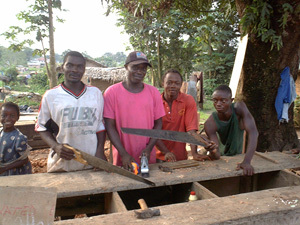 [Liberia] Prince Obi (in pink) struggles to earn his living as a carpenter in Zwedru. July 2004. “For those of us who are not ex-combatants - what are we to do? As for them [the combatants], you are training them! It would be fair for us to learn something too!” said Marcus Kaytoe, a 19-year-old hanging out on the main street in Zwedru. Around the corner, carpenter Prince Obi tries to earn a living in his road-side workshop. “There’s not enough work! Yes, everything is moving fine, but we need work,” said Obi. He is pleased that fighters are handing in their weapons, but at the same time he's struggling to support his wife and three children. “It is difficult especially with these tools. They are too old, anything of any value was taken during the war,” he said. Back in the north in Voinjama, the headquarters for the rebel group Liberians United for Reconciliation and Development (LURD), Amara Kamara stands astride his new bike, waiting for the cantonment site in town to open. Peacekeeping forces have received reports from residents in Voinjama and other towns in the border region with Guinea, that former combatants are crossing the frontier trading their guns for consumables such as bikes. Kamara said he bought his bike in Guinea and paid cash -- 150,000 Guinean Francs, around US$60. “I wanted a car, but I had to get a bike instead as I didn’t have enough money,” he said. He still uses his fighter name, Namo Tamo. “It means jungle warrior - the man with no destination,” he explains. He’s only in his mid-twenties, but says he’s been fighting on one side or the other since Liberia’s civil war began in 1990. Now he’s preparing to hand over the weapon in his house and get his US$300. At the moment Kamara makes a bit of money cruising about town on his bike selling cigarettes and batteries. With his disarmament money, he plans to buy goods in Guinea and sell them in Voinjama. The bike also comes in handy for romancing. “You can take your lady out for a ride,” he said, pointing to a not so comfortable looking spot on the handlebars. But there are other opportunities available for men like Kamara. Humanitarian workers in Guinea say that former LURD combatants living in the towns and refugee camps close to the Liberian and Ivorian borders are crossing into Cote d’Ivoire to fight there or just using their arms to carry out looting raids. Likewise in Zwedru, the headquarters of the Movement for Democracy in Liberia (MODEL) near the Cote d'Ivoire border, humanitarian workers report fighters are crossing over for a new battle. For many though, going back to school is a priority. Robert Thomas is a senior MODEL officer, who also goes by the name of ‘Flying Eagle’. “The enemy can’t see me, but I can see them, from the air,” he explains. Speaking to IRIN at the marijuana smoke-filled MODEL headquarters in Zwedru, Thomas said he was pleased to be disarming. “Everybody is happy to be giving up their weapons. We are fed up with rebel activities,” he said. But he admitted peace would not be easy. “I’m more than 30. An old man! And now I have to start from the beginning to learn my A-B-Cs again like a small child."